I’ve not set out to rubbish metal containers or metal container manufacturers; far from it. They produce good quality products. My aim is to dispel a myth because there’s room and reason for both in the marketplace, and it’s just not the case that metal containers are superior to plastic. I have worked in the waste industry for more than 30 years and operated both municipal contracts collecting trade refuse and C&I collection depots. I used to specify metal containers rather than plastic. Why? Because there was a perception they lasted longer because the fronts didn’t bow or crack, the lifting lugs didn’t break off and, if the bin was fire damaged, a plastic container would just be a molten blob on the ground. Even up until 2001, landfill tax hadn’t really kicked in and we were collecting probably 150+ kilos per bin! No wonder then that some plastic bins used to bow and break, particularly those situated outside garages and window companies. Landfill tax is now £80 per tonne (from April 1 2014) and all contractors are offering separate residual and DMR (Dry Mixed Recycling) collections to their customers. Most collectors have on-board container weighing equipment fitted. The last thing they want to collect are heavy residual waste bins (100 kilos = £8.00 in landfill tax alone with little or no material value in the bin). Today, the optimum residual waste bins weigh between 50 and 65 kilos per 1100 litre container. Anything above that needs to be either price managed or discarded to another collector (without weighing equipment obviously). In fact, collectors would reduce this weight further if they could or at least recoup the additional costs in a highly competitive collection market. So, based on the fact that the optimum residual waste bin is now averaging around 60 kilos and DMR / recycling bins are weighing around 35 kilos, and that a metal bin is significantly more expensive (sometimes double that of a plastic one) and heavier, where’s the logic in specifying metal rather than plastic. The point made about whole life value is very interesting. Talking to a customer who buys both metal and plastic containers, I was told that metal bins last longer and that he depreciated them over ten years and plastic over five. Further into the conversation he said that he also has a mid-term refurbishment on the metal bins which adds around £100 per bin to the whole life cost and this wasn’t depreciated; it was paid as a one off cost. When we looked at the total whole life cost (excluding any spares purchased such as castors and lids), he could have purchased new plastic bins every five years and still been financially better off. Plastic lasts equally as long as metal, depending on the application and type of waste of course so can easily be depreciated over 10 years – as they are throughout Europe. In fact if you do the maths for metal over 10 years and plastic over 5 years, there probably isn’t that much difference anyway, and as segregation techniques improve the load in one bin is likely to get lighter, as it has across Europe. There’s another common myth surrounding plastic bins – fire. No-one seems to mention fires in metal bins, so I can only presume plastic containers must be incendiary devices that either spontaneously combust or are the target of serial arsonists everywhere! Ask yourself, how many containers you’ve had ‘fired’ in the last twelve months, two years, three years etc. I feel sure that it will be less than 1% of your total container assets. Ask yourself, if metal is demonstrably superior to plastic, then why haven’t we all got metal wheelie bins? And what is predominantly used in hospitals for medical waste? Yes, plastic containers. So perhaps not such a major fire risk after all? As for the typically quoted ‘30% better’ figure, I hope this data shows the weight of the material in the container on a year on year basis – I feel sure that it would support my view on changing collection methodologies over the last decade. ESE World containers are manufactured to exacting European standards such as EN840 and RAL -GZ 951/1, the same as their metal counterparts so are designed to withstand the rigors and stresses of everyday operation in the field. In summary, we can separate the facts from the myth. Fact – metal and plastic waste containers do the same job. Fact – metal containers are more expensive than plastic. Fact – metal bins can be recycled just like plastic bins (but are more costly to produce and have a greater environmental impact to manufacture than recycled plastic containers). Fact – spares and refurbishment are available for ESE World containers. 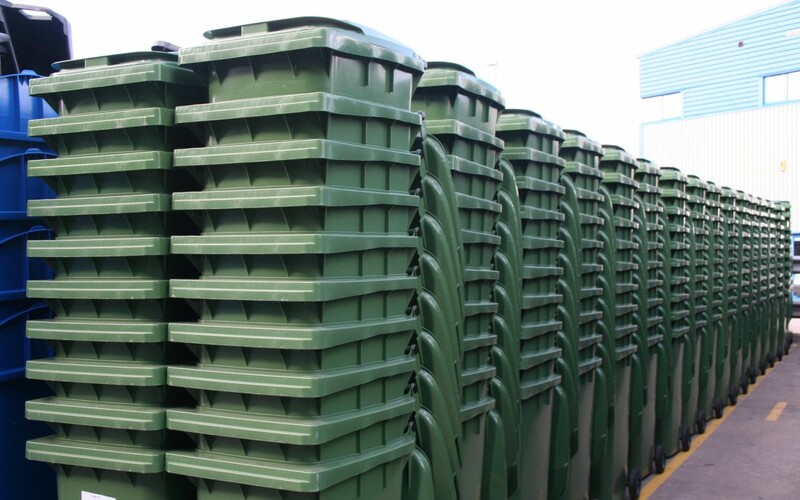 Myth… metal bins last longer than plastic overall.